Whether you’re the head of a marketing firm or a real estate agency, you know a clean workplace is essential for productivity, health, and success. 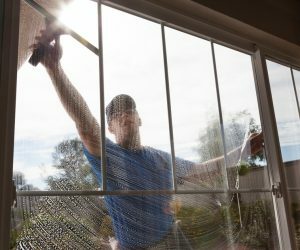 All County Window Cleaning in Vernon, NJ, is one of the area’s most trusted residential and commercial window cleaning companies. Here, the staff explains some of the ways commercial window cleaning can benefit your business. A clean office is essential to preserving employees’ health. They will feel better in a clean environment and, thus, will be more productive. Cleanliness is especially pertinent for staff members with allergies or asthma; they could have reactions to dust or other debris circulating in the air. Window cleaning can be a time-consuming, difficult task. If an employee has to do it, they won’t have as much time or energy to perform their regular work. A commercial window cleaning technician can get the job done quickly and efficiently, allowing your employees to remain focused and productive. Commercial window cleaning specialists have the proper training and equipment to do the job safely. The risk is too high to allow non-professionals to attempt window cleaning on high-rises or other tall structures. Professional window cleaners know what precautionary measures to take to prevent accidents. Curb appeal can make all the difference when it comes to impressing a prospective new associate, employee, or customer. A dirty office can signify poor business practices, while a clean, bright office suggests a sophisticated, detail-oriented business. A commercial window cleaner will ensure your windows are spotless and streak-free, so you’ll always be able to make a stellar first impression. Property maintenance is crucial, especially if you’re leasing. A commercial window cleaner will make sure the windows are always cleaned up to par with lease requirements. A professional cleaner is also more likely to notice signs of damage or deterioration. If the commercial window cleaner does see any evidence of disrepair, he or she will be able to notify you promptly so you can repair the issue before it worsens. For professional residential and commercial window and glass cleaning in the New York and North New Jersey area, call the professionals at All County Window Cleaning. We also offer an array of additional services, including pressure washing and roof treatments. Call (973) 827-8311 or 845-988-5535 to make an appointment or click here to contact us.